Historical narration of technological achievements is more an exception than the rule in India. The narration in respect of rocket development in the country generally follows this trend with a few notable exceptions covering the developments in the Indian Space Programme. The development of defence rockets has hardly been touched upon. Propulsion forms a major subsystem of the space launch vehicles and missiles, and today, India boasts of a significant capability and capacity in this discipline. The solid propellant rocket technology in India is essentially home-grown and has found wide application and adaptation in sounding rockets, launch vehicles, and ballistic missiles. While the requirements of solid propellant rockets for the space programme have reached a maturation phase, the requirement of solid propellant rockets for missile applications are diverse in their characteristics, and performance needs continue on a demand and development trajectory. 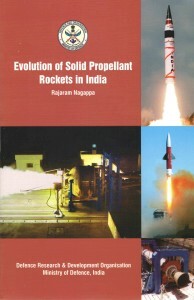 This book highlights the development of solid propellant rockets and the main solid rocket subsystems used in the space programme and ballistic missiles with emphasis on the indigenous nature of development. Professor Rajaram Nagappa is Head, International Strategic and Security Studies Programme, National Institute of Advanced Studies, Bangalore. He holds a Bachelor’s degree in Science from Guwahati University and a Diploma of the Madras Institute of Technology in Aeronautical Engineering. His active years were spent at the Vikram Sarabhai Space Centre, Thiruvananthapuram where he was responsible for the design, development and realisation of solid propellant motor systems for rockets and satellite launch vehicles of the Indian Space Research Organisation. He retired as the Associate Director of the Vikram Sarabhai Space Centre. A longer appreciation of this work, by one ‘present and active at the creation’ must await a detailed read. But for now, all previous commentaries on the solid rocket development programmes at ISRO and DRDO may be safely ignored, with no loss. Very nice to know that a book of a great value, specially in the context of Indian effort for the last four decade, has been brought out by Rajaram . Congatulations . India is certainly the world leader in Solid motors development and it is nice to see that all aspects of development so far have been brought out lucidly in the Book authored by Prof. Rajaram. My hearty Congratulations. I am sure that this book will be of great value for all practicing engineers. Excellent effort Rajaram ! Congratulations. Going through the pages reminding our memories.